White Ops - Detect - and defeat - the web's most evasive bots. Bots are bad for business. Our products provide a constantly evolving immune system for enterprises, fighting the automated bots that cybercriminals use to steal people’s accounts, spread misinformation, and commit fraud. We are white hat hackers who have a deep love and understanding of the internet, and we’re protecting it for ourselves and future generations. In late 2018, White Ops worked with a coalition of industry experts and federal authorities to bring down three sophisticated botnet operations known collectively as "3ve." 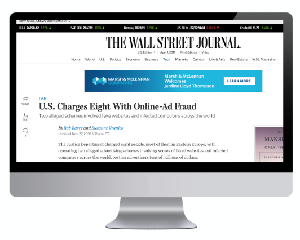 Our work contributed to the indictment and arrest of several perpetrators, introducing a new era of serious consequences for cybercriminals conducting ad fraud. Our constantly-evolving products protect businesses from bot-related threats like fraud, skewing, and credential stuffing. As bots grow in sophistication our products keep our customers one step ahead. White Ops deeply investigates individual impressions to shine a light on even the most evasive bots. Our products constantly evolve to create an incredibly tough system for criminal bots to navigate. Deploy in a variety of ways with products that can work within your use case and technology stack. We partnered with White Ops to scan every single impression - about 9 million a second - offered through our platform before we ever make a bid on it. With this partnership, we can prevent fraud before it occurs.